Hillary "what difference does it make, after all" Clinton covered up the Benghazi terrorist attack by al Qaeda, she, as Secretary of State, ensured the deaths of the 4 Americans there by refusing to bolster security leading up to the attack, she sent Susan Rice onto national television to perpetuate the lie of the "Mo" video, she faked a fall and ill health in order to give herself more time to fabricate her story before Congressional inquisition and finally, when all of her lies and stories fell through, she quit her job as soon as she could do increase the amount of time of herself in the public spotlight from Benghazi to her announcement as candidate for President of the United States of America. Oh, and don't forget what she told the father of one of the former SEALs killed that day in Benghazi...."we will get that producer of that video." Hillary Clinton = Barack Hussein Obama with ovaries. The controversy ignited by the latest story emanating from the decaying carcass that is the New York Times and it's writer, David Kirkpatrick, playing the amateur philologist on NBC's "Meet the Press", magnifies the ludicrousness of political discourse in the second decade of this twenty first century. In one of the most nauseating displays of familial fawning to date, David Gregory all but kissed Kirkpatrick for the dubious conclusions drawn from his investigation into the 2012 Benghazi attack. The centerpiece of Kirkpatrick's report is his conclusion about whether or not Ansar Al Sharia was in fact affiliated with or led by Al Qaida agents. He draws his conclusion, which conflicts with standing testimony and conclusions in DC, from "months of interviews conducted by the New York Times". He also concluded that the attack itself, while conducted by a small disparate, unconnected militant group, was in fact launched in retaliation for the now famed YouTube video about Mohammed. The two things which dissolve the credibility of his conclusions and NYT's investigation are the amount of time that had transpired between the date of the attack and the interviews and his counter claim about the effect of the video tape. Clearly the interviews had taken place some months after the attack and certainly far enough removed to give the interviewees an opportunity to fine tune their comments utilizing information gleaned from the internet and other venues thereby making the content of those interviews unreliable. Second, the claim that the video was the reason for the attack, even hours after the attack was unbelievable given that the video had only been viewed by a particularly small number of people anywhere in the world, much less from the war torn wasteland that is Libya. Predictably, Kirkpatrick launched into a diatribe on the practical use of the word affiliation saying that it can mean different things to different people. Of course he was trying to drive a spike in the heart of the allegation that the militants who attacked the Benghazi compound were "affiliated" with Al Qaida. What is so spectacularly unintelligible about this point is that it had been determined during Libya's revolution that Al Qaida agents were helping and coordinating efforts during that fight. To suggest they simply abandoned the effort after the fact defies logic; making this a focal point of his conclusions does nothing to bolster his credibility or that of those months of NYT interviews. The more important indication of an apparent affiliation with Al Qaida was apparently not obvious to Kirkpatrick and it may well be because he has never sullied himself in a uniform and therefore has little practical understanding of military strategy, alliances and affiliations. He also seems to have missed the fact that anyone adhering to an established religious doctrine, at least academically, forges an unspoken alliance with likeminded adherents to include any divine exhortations to action. His dismissal of the affiliation charge clearly indicates his having discounted the years of investigation, messaging interception and ground reconnaissance which has placed Al Qaida in the midst of far more militant cells and specific attacks than any of us would like. His dismissal of Ansar Al Sharia as a first hand, trained, ideological affiliate, frankly, belies his political leanings more than his investigative gut about the likelihood of such an affiliation given the years of collective action by Al Qaida nearly everywhere in the world. His assertions that Ansar Al Sharia was not "affiliated" with Al Qaida central simply because NYT's late-to-the-game interviews indicated so, puts the entirety of history on its head. Using his logic, The United States effort in the European Theater in WW II, was a unilateral act by virtue of our not being "of Britain". In addition he either doesn't understand the difference between a temporary, military alliance between member nations and an ideological coupling or, was determined to lose his audience in the fog of semantics for another purpose; I respectfully suggest the latter and David Gregory, was more than happy to accommodate him in this most dubious effort by not questioning him on anything tangential to the story. For instance, even if Ansar Al Sharia was neither ideologically nor legally bound to Al Qaida, it still does not explain why Ambassador Stevens was some thirteen hours away from his appointed place of duty, in Tripoli, meeting with Turkish Consul General Ali Sait Akin an hour before the attack. Every story printed or spewed across transmission lines and satellite signals has managed to omit any discussion about this meeting some thirteen hours away from the United States Embassy in Tripoli, across very hazardous roads and in the midst of a very unstable Benghazi and even Congressman Darrell Issa, neglected to mention this when afforded the opportunity to counter Kirkpatrick's claims. The lack of forthrightness by the Administration over these many months indicate the attack itself served more as a convenient cover for the White House and whatever else was going on in Benghazi that night and in the weeks prior, than it did for Ansar Al Sharia or Al Qaida. This is the true travesty of this event; that something untoward or illegal was underway at the compound in Benghazi and is being conveniently sidelined by lesser "concerns". It is equally appalling that after 14 years of intense, national exposure to this same enemy and his ideology that we cannot muster a simple majority in Congress which agrees, at least fundamentally, that the ideology that links all of these cells together with some member states like Iran and Libya could give impetus for these unprovoked attacks. It seems some men cannot help themselves but to continue to give more credence to the actions of men than the doctrines of their 'gods' which compel those actions. It is also clear that the academic investment necessary to truly understand this simple point will never be made at the behest of any Federal agency even though it provides a very specific and accurate understanding of the "why" in these attacks. At least an honest academic debate about Islam would help render a more coherent statement than the mushy love-fest we witnessed this past Sunday on Meet the Press. It might also take this part of the discussion off the table long enough for Congress to ask the truly important questions, like what the CIA was up to in Benghazi, what compelled Stevens, the US Ambassador to Libya, to meet with a Turkish Emissary thirteen hours away from the Embassy, what connection there might be between this event and the Libyan flagged Vessel Al Entisar laden with ill-gotten weapons just weeks before the attack. You know, little things that actually affect US National Security and any vestige of righteousness which might yet remain in the United States of America. And why does this matter? Because somewhere in the musty corners of this misguided Administration festers the next vile plan which includes the unwarranted killing of more American Service members for some yet to be revealed and dubious effort. Believe me, folks, I've been waiting for six years to be able to put up a post here at Holger Awakens on how the Russians came down with the iron fist on Islamic terrorism in their country - I've heard 100 times people say "those terrorists are going to regret that attack, Putin will crush them" but yet I STILL have no article to put up that actually SHOWS how the Russians gathered up 200 of them, or bombed one of their hideouts and killed 20 of them....I'm still waiting. 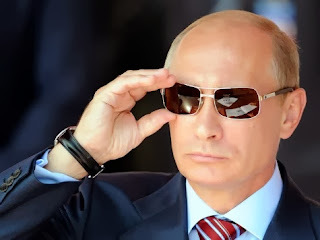 So, once again, after a couple of more Islamic terror attacks in southern Russia, Vladimir Putin is puffing out his chest and warning these terrorists of "total destruction" and once again I will wait to put up a story of just what he did to do that. Don't hold your breath. Talk is cheap in Russia....we all know that too well here in America. MOSCOW: President Vladimir Putin warned "terrorists" on Tuesday they face total destruction, after Russia was hit by double suicide bombings in its southern city of Volgograd that claimed 34 lives. "Dear friends, we bow our heads in front of the victims of the terrible acts of terror. I am sure we will toughly and consistently continue to fight against terrorists until their total destruction", he said. Putin made the comments in a New Year's address from the Far Eastern Russian city of Khabarovsk, which is seven hours ahead of Moscow and where he met with victims of devastating summer floods. "In the current year, we have encountered problems and have been challenged by serious experiences, including ones like the inhuman acts of terror in Volgograd," Putin was quoted as saying by Russian news agencies. Curiously, his New Year's address that was broadcast earlier to the inhabitants of Russia's furthest flung time zones of Magadan and Kamchatka did not mention the Volgograd attacks. Kremlin spokesman Dmitry Peskov confirmed that Putin had broken with a longstanding traditional by departing from the traditional New Year's address which is normally recorded days in advance at the Kremlin. "Here (in Khabarovsk) he made his New Year's wishes and this became his New Year's address. So he basically broke a long-standing tradition." Russia is under siege as within 24 hours of the first suicide bombing by a female terrorist hit a train station, another suicide bomber hit a trolley bus in the same city - this attack is thought to have been the work of a male jihadist. The latest report comes from CNN. 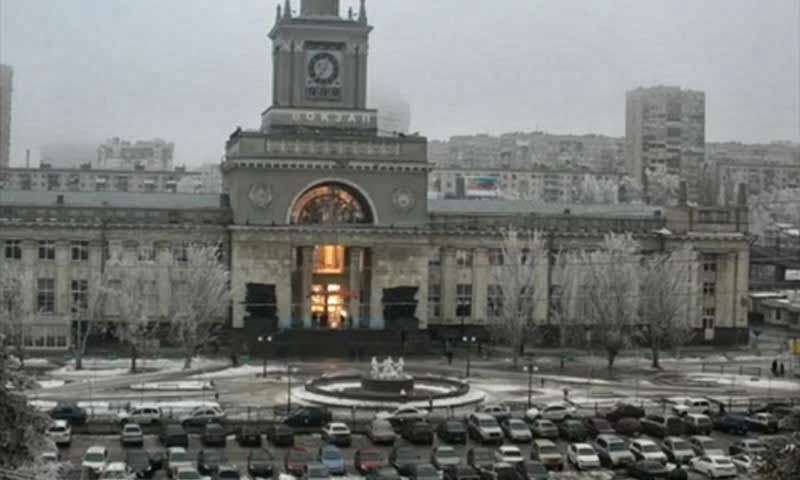 (CNN) -- Another suspected suicide bombing struck the southern Russian city of Volgograd on Monday, killing at least 14 people and further highlighting Russia's security challenges as it prepares to host the Winter Olympics in less than six weeks. 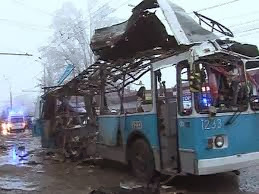 The explosion hit a trolleybus near a busy market during the morning rush hour, a day after a blast at Volgograd's main train station killed 17 people and wounded at least 35. Vladmir Markin, a spokesman for the country's federal investigation agency, told the state-run news agency RIA Novosti that both explosions were terrorist attacks. "This strike, which was cynically planned for the period of preparations for New Year's celebrations, is one more attempt by terrorists to open a domestic front, sow panic and chaos, and trigger religious strife and conflicts in Russian society," said a statement Monday by Russia's Foreign Affairs Ministry. "We will not back down and will continue our tough and consistent offensive" against terrorists, the ministry's statement said, adding that such an enemy "can only be stopped by joint efforts" involving the international community. No one claimed responsibility for the Volgograd blasts, but they occurred several months after the leader of a Chechen separatist group pledged violence to disrupt the 2014 Sochi Winter Olympics that begin on February 7.
International Olympic Committee President Thomas Bach condemned the bombings as "a despicable attack on innocent people. "The entire international movement joins me in utterly condemning this cowardly act," Bach said in a statement, adding that he wrote Russian President Vladimir Putin to express condolences as well as "our confidence in the Russian authorities to deliver safe and secure Games in Sochi." The United States on Monday condemned the Volgograd attacks and offered its "full support to the Russian government in security preparations for the Sochi Olympic Games," National Security Council spokeswoman Caitlin Hayden said in a statement. "We would welcome the opportunity for closer cooperation for the safety of the athletes, spectators, and other participants," Hayden said. Volgograd is a major rail hub in southern Russia and a main transit point for people traveling by train to Sochi on the Black Sea, just over 600 miles (1,000 kilometers) to the southwest. 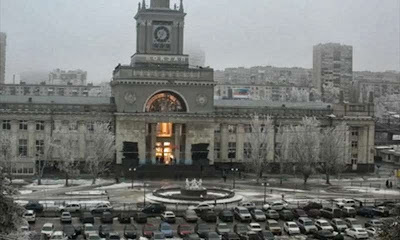 Each day, thousands of passengers use the station in the city once called Stalingrad. Video footage from the scene Monday showed the twisted shell of a blue trolleybus, with debris spread around it. The impact of the blast blew out the roof of the bus, as well as windows of several nearby houses. At least 28 people were reported to be wounded, with several in serious condition, including one 6-month-old child, RIA Novosti reported. Based on the footage, the blast appeared to have occurred in the back half of the bus. The federal investigation agency said it believes the explosion was set off by a male suicide bomber. Investigators said the train station blast Sunday also appeared to have been caused by a suicide bomber. Markin told RIA Novosti that DNA testing will be carried out on the remains of the station bomber, who used the equivalent of 22 pounds (10 kilograms) of TNT in a device containing shrapnel. Investigators said they also found an unexploded grenade at the scene. Video taken from an outside security camera showed a huge fireball inside what appears to be the main entrance of the three-story stone building, followed by a steady trail of smoke coming out of shattered windows. In July, Doku Umarov, the leader of the Chechen group Caucasus Emirate, released a video statement in which he vowed to unleash "maximum force" to disrupt the games at Sochi. The U.S. State Department considers the Caucasus Emirate a foreign terrorist group and has authorized a reward of up to $5 million for information leading to the location of Umarov. The State Department said Umarov organized a suicide bombing outside the Chechen Interior Ministry in May 2009. His group also claimed responsibility for the 2011 bombing of Domodedovo Airport in Moscow that killed 36 people, the 2010 bombings of the Moscow subway that killed 40 and the 2009 bombing of the high-speed Nevsky Express train in which 28 people died. In October, a bomber blew up a passenger bus in Volgograd, killing six people and wounding more than 30 others. Russian media reported that a female Islamist suicide bomber from the Russian region of Dagestan was responsible for that attack. "Most of the militants responsible for terrorist attacks in Russia over the last decade -- including female suicide bombers who have taken part in 20 attacks claiming at least 780 lives since June 2000 -- have come from Dagestan," RIA Novosti reported Monday. The two young men behind the Boston Marathon bombings lived briefly in Dagestan before coming to the United States, and one of them visited the area the year before the attack. "Radical Islamist groups tied to the war against the Russian state now have much deeper roots, and are far more active, in Dagestan than in Chechnya," Rajan Menon, senior fellow at the Atlantic Council, wrote in a CNN.com column. What might be behind the attacks? Putin has maintained that the Sochi games will be safe and security will be tight. Visitors to Sochi and the surrounding area are subjected to rigorous security checks, and vehicle license plates are monitored. However, the Volgograd explosions showed the challenge that Russian authorities face in policing the rest of the country amid ongoing unrest in the North Caucasus. That region includes Chechnya, where Russia fought two wars against separatist movements, and Dagestan. With tight security around Sochi itself, terrorists are believed to be focusing on other parts of the North Caucasus and southern Russia. RIA Novosti reported a car bomb killed three people on Friday in Pyatigorsk in southern Russia, about 160 miles (270 kilometers) east of Sochi. "Rarely do you actually have a terrorist group come out and say, 'We're going to try and disrupt these games,'" CNN national security analyst Fran Townsend said Monday. "When al Qaeda-related affinity groups make these sort of statements, you've got to take them at their word." The fact that the bombers are targeting transportation is "not lost on Olympic Committee organizers and security officials," she added. Athletes are "most vulnerable" when moving between the Olympic Village and the sites of their events, she said. Townsend, who coordinated with Greek officials before the Olympics in Athens in 2004, said security officials all over the world will be asking Russia for detailed information about these attacks, including whether there were any indications or warnings. They'll also ask about what information Russian intelligence has on the capabilities of terrorist groups to pull off further attacks. I always considered Barack Obama an empty suit, a coffeehouse communist, doomed to replay the tragic political and economic mistakes of the past because he lacked any sense of history beyond the clichés of fashionable and comfortable college Marxism. 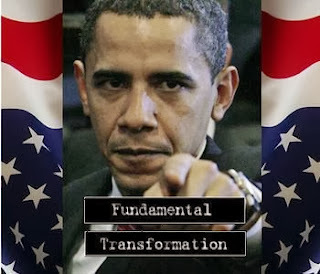 Like the characters and events in his autobiography "Dreams from My Father" written by unrepentant terrorist Bill Ayers, Obama is a composite, the manifestation of a liberal fantasy, a man who, like his acolytes, exists in a political "Twilight Zone" somewhere between reality and narcissism. Obama's political talent is based on his mastery of the platitude; a banal or meaningless statement, generally directed at soothing the social, emotional, or cognitive unease of uninformed, easily misled voters or desperate liberals in search of a Messiah. His ascension to the Presidency can largely be attributed to a combination of corruption and cowardice. Since 2008, pressured by a biased, left-leaning media, a spineless Republican Party leadership joined the Democrats in refusing to vet Obama in violation of the Constitution and common sense. Out of fear or complicity, a conspiracy of silence has descended upon the public discourse regarding all questions related to Obama's background and fitness for office. Despite the enormous historical and Constitutional implications, the politicians and the media, not only have remained silent, but have actively suppressed legitimate inquiry. When the truth is eventually told, the chronicles of the Obama years will represent the most sordid in American history. Having been granted immunity from any uncomfortable questions about his personal history, Obama has established lying as an instrument of government policy e.g. Fast and Furious, Benghazi, IRS, NSA and Obamacare. He has also attempted to render Congress powerless by unlawfully assuming executive authority not granted under the Constitution in order to continue, unobstructed, his fundamental transformation of the United States. Left unimpeded, the inevitable result of Obama's policies will be a dystopia, characterized by a cataclysmic decline of society, in which a totalitarian government enforces ruthless egalitarianism by suppressing or denouncing ability and accomplishment, or even competence, as forms of inequality. Obama aims to create dependency on the state and will continue efforts to prevent the family from reestablishing itself as America's primary social institution. Like "Nineteen Eighty-Four," Obama's dystopia will be a world of perpetual crisis, omnipresent government surveillance, misinformation and manipulation by state-controlled media; all governed by a privileged and oppressive political elite led by a quasi-divine party leader who enjoys an intense cult of personality and considers personal liberty as a source of unhappiness. In his article, "Why Americans Are Not Taught History," Christopher Hitchens, identified the vulnerability of America's present-tense culture to the utopian myth. That is, for the truly blissed-out and vacant servitude required by the Obama strategy, you need an otherwise sophisticated society to lose any sense of its own history and traditions. Using media deception and historical revisionism, the low-information voter will slouch towards Obama's utopia by a combination of governmental coercion as in George Orwell's "Nineteen Eighty-Four" and the hedonist nihilism of a painless, amusement-sodden, and stress-free consensus managed by the nanny-state found in Aldous Huxley's "Brave New World." In the book "Amusing Ourselves to Death," Neil Postman notes that in "Nineteen Eighty-Four," people are controlled by inflicting pain; in "Brave New World," they are controlled by inflicting pleasure. Orwell feared we would become a captive culture. Huxley feared we would become a trivial culture. Obama plans to do both. Ultimately, when the government is ruled by individuals unconstrained by law, there are few things that power cannot do. It can make political allies rich or paupers of political enemies. It can waste billions of dollars without accountability and destroy an economy without responsibility. It can make incompetent men high officials or make extraordinary men corpses. The accumulation of excessive power in the federal government transforms it into a dysfunctional super-state dedicated to maintaining its own power irrespective of truth or the well-being of the country. The bureaucrats can ignore both morality and the lessons of history, in order to protect their appetite for and the use of raw power. Under such circumstances, the government need not fear that any of its agencies will intervene on behalf of the people, nor will it hear any protests from their elected representatives, nor anything but polite questions from the national media. We now have a government and media of perfidious men and women, who are willing to risk the survival of the country rather than risk the truth. There is a Cold Civil War underway in the United States to determine who should control the federal government. It is not a contest between the Democrat and Republican ideologies, but a battle between the entrenched power of the bipartisan political establishment versus the rights and liberties of the American people. Representative and responsible government will not return to America simply by removing Obama. It will only be restored when Americans feel empowered by their political institutions, not misled or oppressed by them. Rather than serve the country, many in the federal government have succumbed to political expediency and avarice, thereby perpetuating an atmosphere of permanent corruption in Washington, D.C.
Clearly, those who are a fundamental part of the problem can no longer be considered as potential participants in a solution. Ordinary Americans must now take a stand against the political-media elite to restore the Constitution and the rule of law, to establish political and fiscal sanity and to return the government to the people. Two of the most tragic Islamic attacks on Christians, killing several women and children, took place in the month of October, one in Syria, another in Egypt. On October 21 in Syria, U.S.-supported Islamist rebels invaded and occupied the ancient Christian settlement of Sadad for over a week, until ousted by the Syrian army. What took place that week was "the largest massacre of Christians in Syria," in the words of Orthodox Archbishop Alnemeh. Among other things, 45 Christians—including women and children—were killed, several were tortured to death; mass graves were discovered; all of Sadad's 14 churches, some ancient, were ransacked and destroyed; the bodies of six people from one family, ranging from ages 16 to 90, were found at the bottom of a well (an increasingly common fate for "subhuman" Christians). The jihadis also made a graphic video (with English subtitles) of those whom they massacred, while shouting Islam's victory-cry, "Allahu Akbar!" ["Allah is Greater!," meaning "than anything"]. Another video, made after Sadad was liberated, shows more graphicatrocities. The day before rebels invaded Sadad, on Sunday, October 20, the Church of the Virgin Mary in Warraq, near Cairo, Egypt, was attacked during a wedding ceremony. The attack left four dead and nearly two dozen wounded. According to a report issued by a forensic team, two of those murdered were young girls, each named Mary: 12-year-old Mary Nabil Fahmy, who was shot five times in the chest, and 8-year-old Mary Ashraf Masih ("Masih" meaning "Christ"), who was shot in the back. The security forces charged with protecting the church were seen leaving their posts immediately before the massacre began, as happens frequently in Egypt and other Islamic nations. In the words of Asia News, "Eye-witnesses of the al-Warraq attack confirm that despite numerous distress calls, police and ambulances only arrived on the scene two hours after the shooting." These massacres in Syria and Egypt received scant attention and even less condemnation from Western media and governments. Instead, people such as Mohamed Elibiary, an Obama administration Homeland Security adviser, condemned Copts who raise awareness of anti-Christian violence in Egypt as promoting "Islamophobic" bigotry. Although Christians are habitually killed in Muslim countries, as this series attests, the U.S. government rarely condemns the practice or even acknowledges it. When five Muslims were killed in western Burma, however, the U.S. issued a formal condemnation, according to Voice of America, "urging authorities to do more to address the long-standing sectarian tension there." Bangladesh: "A local government official in central Bangladesh has halted the construction of a church, forced Christians to worship at a mosque and threatened them with eviction from their village unless they renounce their faith," said Morning Star News. "The Tangail Evangelical Holiness Church in Bilbathuagani village… was created Sept. 8 by a group of about 25 Christians who had been meeting secretly for three years. However, local council chairman Rafiqul Islam Faruk joined around 200 demonstrators Sept. 13 to protest against the start of the building of the church. The following day, the Christians were summoned to his office. More than 1,000 Muslims waited outside, following an announcement at all local mosques to gather at the chairman's office." There, they were ordered to embrace Islam or suffer the consequences. Said one of the Christians: "Their threats chilled me to the bone. That is why I pretended to accept Islam, but faith in Christ is the wellspring of my life." Another said: "The chairman is clipping the wings of our faith. I do not know how long we can grin and bear it. We want religious freedom. We want to practice our religion freely." Since Sept. 14, under the chairman's orders, eight Christians agreed to return to Islam. Apparently, the chairman and his associates had already beaten some of these Christians three years ago for accepting Christianity. Iran: Mariam Naqqash, a female convert to Christianity, was sentenced to four years in prison by a court in Tehran. The Christian convert was found guilty of "endangering national security by spreading religious propaganda in the country," and allegedly being a spy for Britain and Israel. According to Adnkronos News, "renouncing the Muslim faith is punishable [in Iran] with the death penalty. Over 300 Iranian converts to Christianity have been arrested over the past two years, according to opposition websites." Kazakhstan: After Bakhytzhan Kashkumbayev, a 67-year-old pastor, was released from five months' detention, based on charges his family and others insist are spurious. After being reunited with his family, he was arrested again within minutes, now accused of "propaganda of terrorism or extremism, or public calls to commit an act of terrorism or extremism, as well as the distribution of material of the content indicated." His son, Askar, told Forum 18 News Service, "These new accusations are complete rubbish. They're trying to turn my father into a terrorist." Grace Church in Astana, where Kashkumbayev served, has, according to the report, long been subject to state harassment, including accusations of being involved in espionage, fraud, money laundering, distributing extremist texts and using hallucinogenic communion drinks. Kenya: Charles Matole, pastor of the Redeemed Gospel Church, was found shot dead while still sitting with a Bible on his lap: "We found him with blood oozing from the head," said a choir member. The pastor had been receiving threatening phone text messages. Similarly, Pastor Ebrahim Kidata of the East African Pentecostal Churches was found murdered, strangled to death, in a patch of bushes. After a Muslim man slaughtered a Christian—in broad daylight and in front of police—accusing him of being "an infidel who blasphemed against Muhammad" (see September report), a group of armed men broke into the dead man's family home, threatening to kill its members if they did not withdraw their police complaint against the murderer, and convert to Islam. Fr. Arshad Gill, a priest in Karachi, told Asia News "about this 'sad story' in which the victim is 'an innocent man' and his family is told to convert to Islam or die. For him, the case epitomizes the situation of Pakistan's minorities, forced to live 'in conditions of profound insecurity' in which events such as this one tend to exacerbate the situation…. Found in Article 295, B and C of the Pakistan Penal Code, the [blasphemy] 'law' punishes with death or life in prison anyone who desecrates the Qur'an or defames the name of the Prophet Muhammad." Those few political activists who have tried to repeal the law—such as Punjab Governor Salman Taseer, a Muslim, and Minorities Minister Shahbaz Bhatti, a Christian—have been murdered. Three other Pakistani Christians face a possible death sentence on what lawyer Sardar Mushtaq Gill says are "trumped up charges" of blasphemy. One of the Christians, Asif Pervaiz, is accused of sending phone text messages with "abusive language against Muslims, Islam, Prophet Mohammed and the Koran." Two other Christians, Pastor Adnan and Mushtaq Masih, were also arrested for allegedly writing "derogatory remarks" about Islam. Gill also said, "Days back we received some heart breaking information that there is one group who forced Christians to accept Islam at gun point." Another Christian man accused of blasphemy, 26-year-old Adnan Masih, trained as a pastor at a United Pentecostal seminary, is being hunted by police. In addition, the banned Islamic extremist group, Jamaat ud Dawa, in Lahore, issued a fatwa, or Islamic decree, calling for his death because he sought to correct misconceptions about Christianity in a Muslim book by noting biblical verses that refuted Islamic characterizations of Christianity. A source said that the hunted man had no idea that "pointing out false references in a book would land him in such big trouble." In the words of a representative of Jamaat ud Dawa: "The police better arrest the blasphemer and hand him over to us on Saturday [Oct. 19]. We will not be responsible for any law-and-order situation in the city if the police fails to keep its assurance. How dare someone use derogatory language against our beloved prophet … Don't they know that the Koran orders us to slit the throat of whoever is disrespectful to Allah's beloved prophet." Rana Tanveer, a chief reporter for The Express Tribune, received a one-page letter in Urdu threatening him to stop covering the plight of minorities. He was further accused of being an "apostate" for allegedly sympathizing with Christians and Ahmadis, instead of with their Sunni Muslim oppressors. He was also threatened with death, "from where you cannot even imagine." Tanveer, a Muslim, insists that all his reports are objective and based on facts. Egypt: After Muslims in al-Minya district accused a young man of having an illicit relationship with a Muslim woman, violence erupted against the village's Christians (see September report). The father of the Christian man insists that there was no relationship between his son and the Muslim woman, whose family, in his words, "actually had their daughter undergo a gynecological exam, which proved the woman is 'untouched' [a virgin]." Instead, according to the father and many Copts in the village, "the whole story was fabricated by Muslim hard-liners from neighboring village to cause sectarian strife." 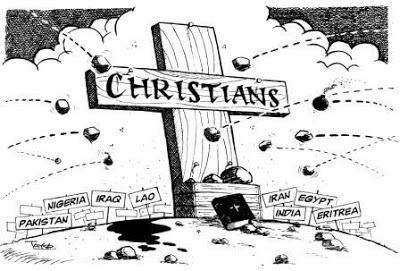 According to a separate Arabic report, "criminal groups and gangs managed to acquire guns and weapons and, as usual, have attacked and abused the Christians … [and] forced Copts to pay large amounts of money as tax [jizya] in order not to steal and/or plunder their lands." The report also points out that no one does anything to oppose these gangs: "they simply kill Christians and their families as happened in the village of Shameiya when two Copts refused to pay the tax: the gang killed them and this was repeated in many other villages belonging to the governorate of Asyut. It is becoming so normal now to watch as these crimes against Christians occur day by day and nothing is done." Indonesia: Still insisting that Susan Jasmine Zulkifli, a Christian woman appointed governor of the sub-district of Lenteng Agung, in West Java, be removed solely because of her faith (see September report), Muslim protesters stepped up their threats, including carrying a coffin in a protest march of some 600 Muslims—a clear death threat —and waving flags symbolic of death. The Christian woman had been promoted in June by the Governor of Jakarta, who said in response: "I make my choices based on merits, not looking at religion." Iran: After being arrested in a house church December 2012 and charged with consuming alcohol in violation of the Islamic theocracy's laws, four Christians were sentenced to 80 lashes for drinking communion wine. "The sentences handed down to these members of the Church of Iran effectively criminalize the Christian sacrament of sharing in the Lord's Supper and constitute an unacceptable infringement on the right to practice faith freely and peaceably," a human rights activist said. Iraq: The nation's Christians, more than half of whom have fled since the U.S.-led invasion a decade ago, are now also being targeted in and fleeing from northern Iraq, which until recently was considered a relatively safe region for Christians fleeing violence in the south. Recently, for example, a suicide bomb went off outside the home of Christian politician Emad Youhanna in Rafigayn, part of the Kirkuk province, injuring 19 people, including three of his children. Several more bomb attacks have also taken place in the northern city of Erbil, for which al-Qaeda claimed responsibility. According to Christian News, "In early September, Christians in the village of Deshtakh complained that they were facing harassment from local police. A group of Christian young people said that policemen told them that they 'should not be in Iraq because it is Muslim territory.' Violence in the south of the country is also escalating. Church leaders in Baghdad say that there are attacks onChristians every two or three days." Lebanon: Muslims in the historically Christian nation are appropriating Christian land. According to Agenzia Fides: "An urgent reminder to curb the misuse of land belonging to Christians in order to build housing for the Muslims was launched on Monday, October 14 from Talal al- Doueihy, leader of the Movement 'Lebanese Land, our Land'…. Across the Country there are outbreaks of clashes due to problem regarding land. Last week, in the Christian village of Alma (district of Zghorta) residents had complained that the Muslims of the area of al-Fuar had begun to build houses without permission. Already at the end of August, the same Maronite Patriarch Bechara Boutros Rai had called Christians to limit the sale of their property to avoid jeopardizing the demographic-confessional balance." Pakistan: After the bombs in the church of All Saints in Peshawar, where nearly 90 people, including many women and children, died, Agenzia Fides reported that, "the situation remains tense in the Pakistani society: not only tragedy but also horror. The Christians said they were 'horrified' by the rumors that link the bombs in Peshawar to the vast problem of organ trafficking: this is what some members of NGOs in civil society in Pakistan told Fides. Some of the 'jackals,' presumably local paramedics, seem to have taken advantage of the high number of deaths and injuries in order to steal the bodies of victims and exploit them for the illegal organ trade. 'If this were true, it would mean that there are criminals who are taking advantage of the suffering of Christian victims in a truly blasphemous and sacrilegious manner,' notes Fr. Mario Rodrigues, a priest of Karachi." Meanwhile, some of the Christian survivors who mourned the deaths of loved ones too openly, were attacked, beaten, and threatened with death. Finally, in a separate story, a Christian, Harrison Masih, working in a store, who used to debate religion with a Muslim customer, Maulvi Khalad, got into an argument when Khalad tried to get him to convert to Islam, "telling him that he would enter paradise that way." But, as Harrison related, because he refused to convert and apparently did not want want any trouble, "I quit my job at the medical store but Khalid, and three other men, came to my house and threatened me and my family." To document that which the mainstream media often seems to fail to report. To suggest that such persecution is not "random" but systematic. These accounts span different ethnicities, languages, and locations. It's Sunday. Which Means It Is the Day Boko Haram Kills In Nigeria. 8 Dead This Time Around. Sundays are usually guaranteed for two things - a wave of bombings across Iraq and Boko Haram goes on an Islamic killing spree in Nigeria. Today, Boko Haram didn't break the routine...still waiting on Iraq. 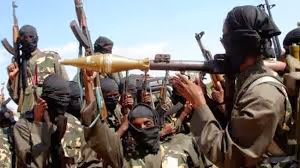 MAIDUGURI: Suspected fighters from Islamist group Boko Haram opened fire on a bachelor party in northeast Nigeria, killing eight people and wounding several others, witnesses said on Sunday. Boko Haram is fighting to impose strict Sharia or Islamic law in mostly Muslim northern Nigeria and has become a serious threat in the oil-producing Niger Delta. Nigeria President Goodluck Jonathan ordered an all out offensive against the northeastern rebels in Africa's leading energy exporter. Though they retreated into a hilly area around the Cameroon border, the rebels have since stepped up attacks on both soldiers and civilians. "Three Boko Haram members came on motorcycles at about 11 yesterday night," Abdul Usman told Reuters in the main northeastern city of Maiduguri, where he fled after escaping the attack on Tashan Alade village. "They were shooting indiscriminately." Nigerian forces have stepped up the offensive against the rebels in the past few days after Boko Haram fighters armed with grenade launchers and anti-aircraft guns attacked an army barracks in the town of Bama. The spineless al Qaeda-affiliated Islamic terrorists in Chechnya and surrounding areas in Russia are very adept at recruiting women to go blow themselves up for the cause of allah....actually, it's because the men are too chicken to actually put themselves in that position. And Russia needs this like they need another revolution with the Olympic Games approaching and now train stations are blowing up. As I have stated before...Russia has a Muslim problem. MOSCOW: A female suicide bomber killed 14 people Sunday when she blew herself up at the main train station in the southern city of Volgograd, raising concerns about security in Russia just six weeks before the Sochi Olympic Games. The unidentified woman set off her charge after being stopped by a police officer at the metal detectors at the entrance to the station while it was packed with people travelling to celebrate the New Year, regional officials said. Footage of the blast captured by a nearby camera showed a huge fireball blow out the front doors and a row of windows from the grey stone three-story building, before huge billows of smoke poured out as people scattered along the street. Russia's Investigative Committee spokesman Vladimir Markin said officials had launched an inquiry into a suspected “act of terror”. “A suicide bomber who was approaching a metal detector saw a law enforcement official and, after growing nervous, set off an explosive device,”Markin said in televised comments. Officials said at least 34 people were injured by the blast that had the explosive equivalent of more than 10 kilogrammes (16 pounds) of TNT. It was the deadliest attack in Russia for almost three years. The police officer who spotted the woman died in the attack while several others who were stationed at the metal detectors were wounded by the blast. State television said their actions prevented “hundreds” from being killed. The lifenews.ru website meanwhile posted a picture of what it said was the head of the young female bomber lying amid a pile of debris with her long brown hair spread across the floor. “It was a very powerful blast,” train station store attendant Valentina Petrichenko told the Vesti 24 news channel. “Some people started running and others were thrown back by the wave of the blast,” she said. The city of Volgograd, known as Stalingrad in the Soviet era, was already attacked in October by a female suicide bomber with links to Islamists fighting federal forces in the nearby volatile North Caucasus. The October 21 strike killed six people aboard a crowded bus and immediately raised security fears ahead of the February 7-23 Winter Games in Sochi. The Black Sea city lies 690 kilometres (425 miles) southwest of Volgograd and in direct proximity to the violence ravaging daily in North Caucasus regions such as Dagestan and Chechnya. Militants are seeking to impose an Islamist state throughout Russia's North Caucasus. Their leader Doku Umarov has ordered rebels to target civilians outside the region and disrupt the Olympic Games. President Vladimir Putin staked his personal reputation on the Games' success by lobbying for Sochi's candidacy before the International Olympic Committee and then spending more than $50 billion (36 billion euros) for the event. The Kremlin said Putin was “immediately” informed of the attack. “The president is receiving reports as the events develop and as new information comes in, first of all, this concerns the number of people injured and killed,” Putin spokesman Dmitry Peskov told Russian state television. Militant attacks have become part of daily life in the mainly Muslim Northern Caucasus but the Volgograd blast will be a particular concern to the authorities as the bomber struck a city of over one million in the Russian heartland. The Volgograd attack is deadliest in Russia since the suicide bombing on Moscow's Domodedovo airport in January 2011 that killed 37. Russia's interior ministry said separately that it was immediately stepping up security at all the nation's main train stations and airports. “These measures involve a greater police presence and more detailed passenger checks,” an interior ministry spokesman told the Interfax news agency. Russian authorities have repeatedly vowed to take the highest security precautions in Sochi. There have been few indications to date of foreign sports fans cancelling their attendance out of security fears. Female suicide bombers are often referred to in Russia as “black widows” women who seek to avenge the deaths of their family members in North Caucasus fighting by targeting Russian civilians. Female suicide bombers set off blasts at two Moscow metro stations in March 2010 that killed more than 35 people. So-called black widows were also responsible for killing more than 90 people when they took down two passenger jets that took off from a Moscow airport within minutes of each other in 2004. The story comes from Jihad Watch via The Religion of Peace. Thirty-year-old Faruk Rooma, a Pakistani national, was sentenced to life imprisonment and deportation for life, while her two accomplices, her 19-year-old nephew, Aafaq Alam Khan and his friend, 17-year-old Noureddine El Yousfi, were sentenced to ten and seven years in prison. All three appealed on the spot. On Friday, September 14 in the early afternoon, a woman and two young men broke into the apartment where the murder victim was home alone. While the two men held on to the terrified woman, the Pakistani woman doused her with gasoline and set a match to her. During the explosive fire that occurred, the now two convicted young men succeeded in getting out of the apartment, while the Pakistani woman had to jump out of a window with her dress in flames. She was in an unconscious state and was admitted to a hospital with severe injuries and burns on her arms. During the hearings, the now lifetime convict and deportee Faruk Rooma stated that since May 2001, she had been secretly married to the murdered woman's husband. The marriage had taken place in a parking lot in Ringsted, where an imam married them. 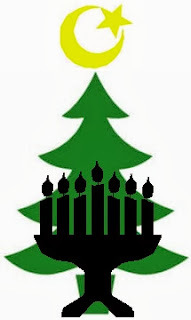 The man's family was not allowed to know anything about marriage, and she was furious and had a shock when on June 22, following his family's orders, he suddenly married his cousin from the U.S.
"A flag bearing a crescent and star flies from a flagpole in front of the World Trade Center, next to a Christmas tree and a menorah." In 1997, Mohammed T. Mehdi, the head of the Arab-American Committee and the National Council on Islamic Affairs, lobbied to have a crescent and star put up at the World Trade Center during the holiday season. His wish was granted, despite the fact that he had been an adviser to Sheik Omar Abdel-Rahman also known as the Blind Sheikh. In the name of diversity and political correctness, an adviser to the religious leader behind the World Trade Center bombing, was allowed to plant an Islamic symbol of conquest in the very place that had been bombed. Long before the Ground Zero Mosque was even a twinkle in the eye of a violent ex-waiter and a slumlord Imam, the World Trade Center allowed Mohammed T. Mehdi to bully it into flying the symbol of Islam. By 1997, Mohammed T. Mehdi had become an unambiguously ugly public figure. He had been fired by Mayor Dinkins in 1992 for anti-Semitic remarks. The year before he had proclaimed that, "Millions of Arabs believe Saddam stands tall having defied Western colonialism". In 1995, the US Attorney's Office in New York had listed Mehdi as an unindicted co-conspirator in the trial of Sheikh Rahman. Mehdi had already published a book titled "Kennedy and Sirhan: Why? ", which contended that Robert Kennedy's assassin had been acting in self-defense. Because of Mehdi's role in actively working on behalf of the Sheikh behind the wave of terrorism that included the original attack on the World Trade Center, turning down his request should have been a no-brainer. Instead in the winter of 1997 there was an Islamic star and crescent at the World Trade Center. And another one at the park in front of the White House. Four years before the September 11 attacks; both targets had already been marked. The previous year had marked the first annual Ramadan dinner at the State Department, integrating the Islamic celebration into the Clinton Administration's schedule of events. Bill Clinton had not visited the World Trade Center after the bombing, but he did make time for Ramadan. A month after 9/11, Bush went Clinton one better when he became the first president to host a Ramadan dinner at the White House. Many of the Muslim ambassadors at the event were representing countries that helped finance Al Qaeda. Little more than a month after September 11, the President of the United States sat down to break bread with the money men behind the attacks. The Star and Crescent flying at the World Trade Center did not prevent it from being targeted in a second greater attack four years later. Nor did the Ramadan dinners keep the plane headed for the White House at bay. It took the self-sacrifice of its American passengers to do that. Instead every gesture of appeasement only seemed to make it worse. Before the star and crescent flew at the World Trade Center, the site suffered only a few dead. After it, thousands dead. The more Ramadan dinners Bush hosted, the more Americans died, because the Star and Crescent and the Ramadan dinners both expressed a deliberate blindness to the threat of Islamic terrorism. No one who understood what had happened at the World Trade Center in 1993, would have permitted a banner associated with its attackers to be flown there. But while the Port Authority of New York and New Jersey, let Mehdi have his way with the World Trade Center, other Muslims were working to carry out Sheikh Abdel-Rahman's agenda for a war on America and the free world. "Cut the transportation of their countries," the blind Sheik had commanded, "tear it apart, destroy their economy, burn their companies, eliminate their interests, sink their ships, shoot down their planes, kill them on the sea, air, or land." While the Star and Crescent was blowing in the cold December wind coming off the Hudson River, an even colder wind was blowing out of Hamburg, Afghanistan and Saudi Arabia. A year earlier Khalid Sheikh Mohammed had come up with the idea and presented it to Osama bin Laden. A year later the operation began to move forward. While Secretary of State Albright was holding her Ramadan dinners, other Ramadan dinners were being held out of sight at which more substantive events were being discussed. While the US was busy bombing Yugoslavian civilians in order to create a separatist Muslim state for KLA terrorists; Osama bin Laden and Khalid Sheikh Mohammed were recruiting the first of the 9/11 hijackers. While the United States tried to appease Muslims, Muslims plotted to murder Americans. In 1997, the New York Daily News wrote an upbeat story about Mehdi's Star and Crescent, which envisioned Islam blending merrily into the holiday season. New York may seem a little brighter this holiday season as the glowing Muslim crescent and star symbol nudges its way onto a seasonal landscape of Christmas trees, menorahs and Kwanzaa candles. Watch out, ho, ho, ho-ing Santas you might get drowned out by cheery folks yelling, "Allahu akbar!" Four years later, cheery folks yelling "Allahu Akbar" had filled downtown Manhattan with ashen snow and brightened it with the flames of the burning towers of the World Trade Center. The 9/11 hijackers left behind notes which said among other things, "Shout, 'Allahu Akbar,' because this strikes fear in the hearts of the non-believers". If there were any Santas on those planes, they were certainly drowned out by the cries of "Allah Akbar". And if that didn't drown them out, having their throats being slit by the cheery folks with box cutters surely did. On the Christmas of 2001, New York City was a city with an open wound. Muslims had finally made their impact on the holiday season in a truly unforgettable way. At Ground Zero, workers were still searching through the remains, looking for bodies or parts of them. "It would be like a gift for somebody," a police officer said, who was spending his holiday searching through the debris. A gift for the infidels from Islam. While Muslims were stuffing their faces in November of 2001, Americans were mourning their dead. While Abdul, Mohammed and Raisa were picking through their lamb stew, Americans were picking up the pieces of their loved ones. But it was they who were told to be sensitive to Muslim concerns. From Pakistan, Musharraf urged the US to suspend bombing his Taliban allies during Ramadan. In the name of sensitivity. New York City schools were making arrangements for Muslim prayers out of "heightened sensitivity to Muslim concerns after the Sept. 11 attack". Instead of Americans being on the receiving end of "heightened sensitivity", the ideology that had conspired to murder them was. On the 9th anniversary of 9/11, Islam had another gift for New Yorkers. Having bought up a building damaged in their own attack, they plotted to set up a grand mosque near Ground Zero. Another gift to New Yorkers from the religion that kept on giving. Another Crescent and Star. The same people who did not learn the lesson in 1997, and allowed the Crescent and Star to fly at the World Trade Center, were eager to let the Ground Zero Mosque go forward in the name of tolerance. But despite the Crescent and Star, appeasement proved to be no defense. 3,000 died on 9/11 because American leaders preferred to appease, rather than confront. And we are still busy appeasing, like never before. Allah Akbar and Ho, Ho, Ho. The wave of killings of polio workers in Pakistan continues with another worker gunned down in the Khyber area...all because the Taliban suspect the workers of being spies and that the vaccine is actually a way to sterilize Muslim boys. 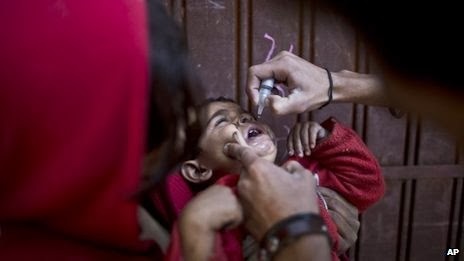 PESHAWAR: Pakistani police say gunmen attacked an anti-polio vaccination center in the country's northwest and killed a medic on duty, then fled the scene. Police official Raheem Khan says another technician was also wounded in Saturday's attack on the outskirts of Peshawar, the capital of the Khyber Pakhtunkhwa province. The health facility is run by the party of cricketer-turned-politician Imran Khan and authorities are using it to vaccinate children against polio. No group claimed responsibility for the attack, but militants have killed several polio workers and police protecting them in recent months. Pakistan is one of only three countries where the polio virus is still endemic. Militants oppose vaccination against polio and consider such campaigns a cover for spying. They also claim the vaccine is intended to make Muslim boys sterile. Video: So, You Got a Tire To Fix, eh? This beyond outrage, this is beyond disbelief, this is beyond suicidal. This is bordering on treason by the POTUS and the State Department. America is endangered by the Muslim Brotherhood and Egypt has now designated the MB as a terrorist organization and still, America's leader and his Secretary of State stand behind this extremist Islamist group. Egypt has declared the Muslim Brotherhood a terrorist organization and enemy of the state. When will America declare Barack Hussein Obama and John Kerry as enemies of our state? The story comes from Times of Israel. 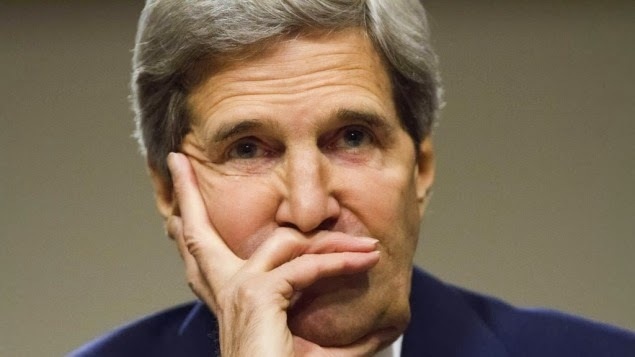 US Secretary of State John Kerry on Thursday expressed widespread concern over the military-backed Egyptian government’s crackdown on the Muslim Brotherhood, days after the once ruling group was designated a terrorist organization. During a phone conversation with Egyptian Foreign Minister Nabil Fahmy on Thursday, Kerry condemned Tuesday’s suicide bombing in Mansoura that killed 16 people and the Thursday bombing that wounded five, but “expressed concern about the interim Egyptian government’s December 25 terrorist designation of the Muslim Brotherhood, and recent detentions and arrests,” according to a statement by State Department Spokeswoman Jen Psaki. Kerry and Fahmy “agreed that there can be no place for violence in Egypt and that the Egyptian people deserve peace and calm,” Psaki said. A US official told Reuters that Egypt was going “way too far” in the crackdown, adding that the Obama administration had no intention of taking any action against Cairo in response, or following suit in labeling the Muslim Brotherhood a terrorist organization. On Thursday, Egypt’s security authorities launched a sweep of arrests of Muslim Brotherhood members and warned that holding a leadership post in the group could now be grounds for the death penalty after it was officially declared a terrorist organization, stepping up the government’s confrontation with its top political nemesis. The announcement came as a bomb exploded in a busy intersection in Cairo Thursday morning, hitting a bus and wounding five people. Though small, the blast raised fears that a campaign of violence by Islamic militants that for months has targeted police and the military could turn to civilians in retaliation for the stepped up crackdown. On Wednesday, Egypt’s military-backed interim government declared the Muslim Brotherhood a terrorist group, criminalizing all its activities, its financing and even membership to the group from which the country’s ousted president hails. The announcement is a dramatic escalation of the fight between the government and group, which has waged near-daily protests since the July 3 popularly backed military coup that toppled President Mohammed Morsi. He said that the decision was in response to Tuesday’s deadly bombing targeting a police headquarters in a Nile Delta city which killed 16 people and wounded more than 100. The Brotherhood has denied being responsible for Mansoura attack and an al-Qaiea inspired group has claimed responsibility for the suicide bombing on Wednesday. “It’s not possible for Egypt the state nor Egypt the people to submit to the Muslim Brotherhood terrorism,” he added. It appears that Hezbollah has retaliated against some of Lebanon's anti-Syria leadership members as a massive car bomb killed five people today including one of the leaders of a coalition back the anti-Assad groups in Lebanon. This fallen leader's last action before being blown up was to send a tweet that degraded Hezbollah. If there is a silver lining in all of this, it's the fact that Hezbollah is now forced to carry out bombings in Beirut and not in Israel. 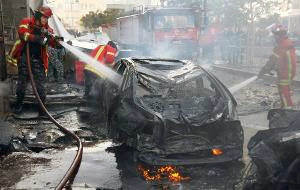 BEIRUT: A huge car bomb rocked central Beirut on Friday, killing five people including an influential member of a coalition opposed to the Syrian regime, and leaving cars ablaze and buildings wrecked. State news agency NNA said that Mohammad Chatah, 62, died as he headed to a meeting of the March 14 coalition at the mansion of ex-prime minister Saad Hariri, in the city centre. Dozens were injured. Footage broadcast by Future TV showed people on fire, others lying on the ground, some bloodied, as well as the mangled remains of a burning car. Some people were seen walking around dazed and shocked. Ambulances as well as security reinforcements rushed to the stricken area, where large crowds had gathered. The blast sent thick black smoke scudding across the capital's skyline and over the Serail, a massive complex that houses the offices of the Lebanese prime minister. NNA news agency gave an initial toll of five people killed and more than 50 wounded in the blast, and said that more than 10 buildings in the area were badly damaged. The Serail, which sits atop a man-built hill and towers over a vibrant city centre, was destroyed in the 1975-1990 civil war. It houses the parliament building, banks, modern glass buildings, shops, cafes and restaurants. "We were opening our store when we heard the blast. It was really loud. We are used to blasts in Lebanon but not in this area. Now we are not safe anywhere," said Mohammad, 23, a shop attendant in the stricken area. Ziad, a 37-year-old businessman whose office is located near the scene of the attack, told AFP: "Chatah was a really respectful person. He was very nice. I was so shocked he has been killed." Asked whether he felt safe in the country, which has suffered a string of explosions in recent months, Ziad said: "If I had the chance to take my wife and children somewhere else, I would." The attack was a grim reminder that the violence that tore Lebanon apart during the civil war is never far away, and comes as a war is raging across the border in Syria. The 33-month conflict, which has reportedly killed more than 126,000 people, has deepened political and sectarian divisions in Lebanon, and sparked often deadly fighting between opponents and supporters of the Syrian regime. Chatah, an influential economist and former minister of finance and Lebanon's envoy to Washington, had served as adviser to ex-premiers Fuad Siniora and his successor Saad Hariri. Hariri heads the anti-Syria March 14 coalition, a group which emerged after his billionaire father and ex-premier Rafiq Hariri was killed in a massive Beirut seafront car bombing in February 2005 that was blamed on Syria. The coalition backs Syrian rebels who have been battling President Bashar al-Assad's forces since mid-March 2011 in a bid to topple his regime. The powerful Shiite movement Hezbollah, a nemesis of the March 14 coalition, has sent militants to fight alongside Syrian regime troops against the rebels, triggering the wrath of many at home. An hour before he was killed Chatah, a Sunni figure, tweeted a message slamming Hezbollah. "Hezbollah is pressing hard to be granted similar powers in security & foreign policy matters that Syria exercised in Lebanon for 15 years," he said, in reference to Syria's nearly 30-year military and political hegemony in Lebanon that ended after Rafiq Hariri's murder in 2005. President Michel Sleiman warned in November that Hezbollah's involvement in Syria was a threat to Lebanon's "national unity and civil peace". His comments to mark the 70th anniversary of Lebanon's independence came just two days after a double suicide bombing struck the embassy of Iran, an ally of both Hezbollah and the Syrian regime, killing 25 people, and weeks after bombings struck Hezbollah's southern Beirut bastion. Lebanon has been without a government for months over deep divisions between Hezbollah and the parties opposed to its involvement in Syria. Friday's bombing came as Lebanese celebrated the Christmas festivities. The swift sword has struck once more. The story comes from http://DAWN. 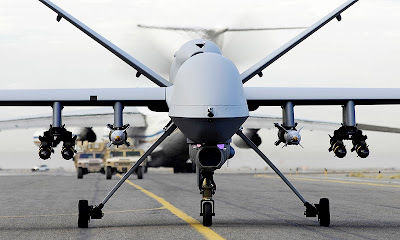 MIRAMSHAH: At least four suspected militants were killed when a US drone fired two missiles at a compound near Miramshah, the main town of North Waziristan tribal agency of Pakistan bordering Afghanistan, DawnNews reported late Wednesday night. The attack took place around midnight in Qutab Khel village, five kilometres (three miles) south of Miramshah. News agency AFP, however, reported three deaths. “A US drone fired two missiles on a militant compound, killing at least three suspected insurgents,” a senior security official told AFP. A security official in Peshawar confirmed the attack and casualties. Another official in Miramshah put the death toll at four and said a fifth militant was seriously injured. The identities of those killed in the strike were not immediately known but officials suspect that they were of Afghan origin. The area residents surrounded the house after the attack and pulled out the bodies, sources said, adding the bodies were charred beyond recognition. The unmanned aircraft kept flying over the area after the strike that took place at around midnight, they said. This was the first drone strike in the area during the month. North Waziristan is one of seven semi-autonomous regions in Pakistan’s Federally Administered Tribal Areas (Fata) governed by tribal laws. The region is chiefly off-limits to reporters because of security worries and government restrictions due to which reliable casualty figures are difficult to acquire from there. An extremist insurgency led by the Tehrik-i-Taliban Pakistan (TTP) plagues the region, known to be infested with militants, including those from Al Qaeda and other armed extremist organisations. Pakistani government criticises drone strikes as a violation of sovereignty and counterproductive to anti-terror efforts. But ties with Washington have nevertheless improved this year after lurching from crisis to crisis in 2011 and 2012. Last month, a US drone attack on a seminary linked to the feared Haqqani militant network in Khyber Pakhtunkhwa province in the northwest killed at least six people. The attack, which militant sources said killed the Haqqanis' spiritual leader along with five others, was extremely unusual as it was mounted outside Pakistan's lawless tribal areas on the Afghan border. From Clare Lopez at Family Security Matters. The single most important fact to understand about Hizballah is that its chain of command goes directly to the Iranian Supreme Leader, the Ayatollah Ali Khamenei, by way of the Iranian Islamic Revolutionary Guard Corps (IRGC) and Qods Force. That Iranian connection, as well as Hizballah's close and long-standing relationship with al-Qa'eda, the global reach of this Shi'ite jihadist group, and above all, its extensive presence and criminal activities in the Western Hemisphere, including inside the United States, all merit a closer look. With U.S. national security directly in Hizballah's cross-hairs, it's more important than ever to understand what this group is, who leads it, what has motivated them along a bloody 30-year trail of terrorism, and what damage this group is capable of inflicting on American interests. For even as Hizballah is an Islamic terror organization, an Iranian proxy for power projection, a Transnational Criminal Organization, and a Lebanese military, political, and social domestic entity, it is above all a direct threat to U.S. national security. After all, and despite a complete media blackout on the topic that prevails to this day, on Iranian orders and working together with al-Qa'eda, Hizballah participated in the worst strike ever against the American homeland: the attacks of 9/11. There is no threshold, ideological or otherwise, that Hizballah has not already crossed or would not cross again, given a direct order from Tehran. Word out of London in late 2013 is that the U.S. is engaged in secret, indirect negotiations with Hizballah, with British diplomats acting as intermediaries. Those talks followed closely on the U.S. capitulation to Iran over its nuclear weapons program during November 2013 discussions in Geneva and reflect a White House policy of seeking to normalize relations with the regime designated by the Department of State as the number one global state sponsor of terror. Hizballah remains a designated terror organization on the Foreign Terrorist Organizations (FTO) list. And while the story about the U.S.-Hizballah talks in London made the Israeli and U.K. media, not one major U.S. media outlet thought it significant to report that the U.S. administration is reaching out to mend relations with what many describe as the most dangerous Islamic terror organization in the world. Former Deputy Secretary of State Richard Armitage called Hizballah the "A Team" and al-Qa'eda the "B Team." Former Homeland Security Secretary Michael Chertoff said that Hizballah makes "al-Qa'eda look like a minor league team." And former CIA Director George Tenet testified in 2003 that Hizballah was every bit al-Qa'eda's "equal, if not a far more capable organization." And yet, since the attacks of September 11, 2001, the biggest share of counterterrorism bandwidth among national security agencies and the media alike has been devoted to al-Qa'eda "and its affiliates," as they're often called. Current internecine civil war in Syria aside, for many years Hizballah happens to have been one of those affiliates, but many would never know that from either the media coverage or official government attention paid to this Shi'ite jihadist group that works mostly for the Iranian mullahs. So, when it's discussed at all, as on each year's remembrance of the October 1983 bombing of the Marine barracks in Beirut, Lebanon, Hizballah continues to be thought of primarily as a Lebanese terror outfit. However, as Tony Badran pointed out in an important historical look back in his November 25, 2013 Weekly Standard essay, "The Secret History of Hezbollah," a critical Iranian connection has been there from the beginning. Media coverage of the Syrian civil war that broke out in 2011 often cites Hizballah as somehow mixed up in supporting the Ba'athist regime of Bashar al-Assad against a conglomeration of al-Qa'eda- and Muslim Brotherhood-dominated militias. But what that coverage often ignores is that Hizballah's contribution of thousands of fighters to the survival of the Assad regime is not necessarily in the best interests (or any interests) of Hizballah's supposed home team, the Lebanese Shi'ites. The reason Hizballah fights on, even after its Syrian adventures have drawn probable Sunni al-Qa'eda retaliation deep into the very heart of its Beirut stronghold in the Dahiyeh, is because Iran wants it to. Hizballah's power base remains grounded in Lebanon where it arose amid the savage sectarian civil war that raged in that country from 1975 to 1990. Its military and political dominance there has been unchallenged since its takeover of large parts of Beirut in a show of force in May 2008. Its social base of operations among the Shi'ites of southern Lebanon buys Hizballah a great deal of good will and loyalty. An expansive social welfare program that includes clinics, hospitals, schools, and youth summer camps targets a population that long felt marginalized by Lebanon's central government. A well-organized system of charity and non-profit groups spreads Iranian largesse while also attracting donations, remittances, and taxes from around the world. Since its creation in the early 1980s, Hizballah has maintained a tightly-organized command structure reflected in a top-down military style inherited from its Iranian sponsors. This hierarchical organization subordinates itself to the Khomeinist Velayat-e Faqih concept, which acknowledges the overall leadership of the current Iranian Supreme Leader Khamenei, to whom, in fact, Hizballah's Secretary General Hassan Nasrallah has pledged bayat (allegiance). Naim Qassem, another Lebanese cleric and a politician who arose out of the Amal movement, is Hizballah's second-in-command after Nasrallah. Although something of a pan-Islamist who has called in the past for an end to Shi'a-Sunni rifts, when it came to Syria, Qassem fell in loyally behind Nasrallah and the Iranian and Russian campaign to save Bashar al-Assad's rule. One of the most important figures in Hizballah history was Imad Mughniyah, a wanted figure across the globe for decades, and arguably Iran's most effective terror chieftain. Assassinated in Damascus in February 2008, Mughniyah led Iranian-Hizballah terror operations, often in close coordination with al-Qa'eda, whose cadres he trained. From the 1983 Marine barracks bombing, to the 1985 hijacking of TWA flight 847; and from the 1992 and 1994 Buenos Aires attacks against Israeli and Jewish targets, to 9/11 itself, Mughniyah was the strategist whose malignant brilliance filled a terror rap sheet that spanned more than two decades. His absence from Hizballah's ranks since 2008 has been a setback to Hizballah's international terror operations, which, to date, have even been unsuccessful in exacting revenge for Mughniyah's assassination. We view the Iranian regime as the vanguard and new nucleus of the leading Islamic State in the world. We abide by the orders of one single wise and just leadership, represented by "Wali Faqih" and personified by Khomeini... Whoever offends the Muslims, offends in fact the body of our Umma, and we shall therefore endeavor to stand up against this threat, guided by a legitimate ruling and an all-embracing political doctrine determined by the leader i.e., Wilayat al-Faqih. As many are aware, Hizballah was funded largely by Iran for many years after its formation in the early 1980s. Estimates vary, but Iranian payments to Hizballah reportedly reached hundreds of millions of dollars per year, and, perhaps, even as much a $1 billion immediately following Hizballah's severe losses in the 2006 war with Israel. Today, however, the picture is quite different. Rarely do the mainstream media adequately address Hizballah's recent transformation into a Transnational Criminal Organization (TCO) and global narcotrafficker. In the think-tank world, Matthew Levitt of The Washington Institute is one of the foremost experts on Hizballah and reveals how the Shi'ite terrorist organization "also runs one of the largest and most sophisticated criminal operations in the world." As he explains, Hizballah has been involved in a range of criminal enterprises for many years, but has moved even deeper into the world of drug cartels and illicit activities since international sanctions over Iran's nuclear weapons program have caused serious economic hardship for the Tehran regime. Hizballah's fundraising operations span the globe and include both legal and illegal business dealings, often conducted under cover of false-front commercial firms. While relying in many cases on an existing network of Lebanese expatriate businessmen for camouflage as well as income from ‘charity donations,' ‘profit taxes,' and outright mobster-like extortion, Hizballah also works closely with its Iranian contacts. Those contacts often are operating under commercial, diplomatic, and other cover arrangements, including as clerics in mosques and Islamic Centers. As described by Alberto Nisman, the Argentinean prosecutor who, in May 2013, issued a 502-page indictment of Iran and Hizballah for the 1994 bombing of the Jewish cultural center in Buenos Aires, Iran's and Hizballah's complex cell networks serve multiple interlocking purposes. Iran's diplomatic expansion gives it a geo-strategic presence and veneer of legitimacy, while its embassies and consulates provide cover slots for the IRGC/Qods Force and MOIS operatives who interact with local Hizballah cells, among others. By extension, those Hizballah cell members reach into gangs, narco cartels, and TCOs. Overall, these highly organized, sophisticated networks enable Iran and Hizballah to fund and support themselves, plot and execute terror operations, and acquire proscribed weaponry and technical gear on black markets. Incredibly, it should be noted that Hizballah also raises funds entirely legitimately, if not with what might be called ‘full disclosure.' Although sanctions regimes and terrorist designations imposed by individual countries like the U.S. and various European governments do limit Hizballah's freedom of action to some degree, the reluctance of many of these entities to designate Hizballah in its entirety as a terrorist organization leaves fundraising channels open through ostensibly charitable and religious fronts. 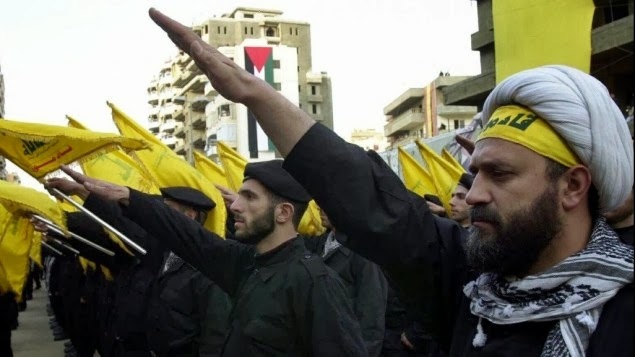 By permitting Hizballah to perpetuate the myth that it is comprised of various so-called ‘wings'-such as military, political, or terrorist-countries that may designate Hizballah's ‘terrorist' wing, still allow Hizballah to continue raising money legally through mosques, Islamic Centers, and at religious events, as long as it can get away with claiming such proceeds go to fund clinics, orphanages, or schools in Hizballah-controlled Lebanon. Such quasi-legitimate fundraising mechanisms aside, however, Hizballah engages in a vast array of criminal activities around the world that include dealing in blood diamonds, counterfeiting, fraud, scams, theft and fencing of stolen goods, and smuggling. This is all in addition to narcotrafficking, which is considered by experts to provide the largest share of Hizballah financing today. Hizballah conducts these criminal operations on virtually every continent in the world (except perhaps Antarctica), which is why the group is termed a Transnational Criminal Organization (TCO) in the truest sense of the term. Iran and Hizballah have both been caught counterfeiting U.S. and European currency, reportedly using printers located in Baalbeck in Lebanon's Beka'a Valley. The U.S. Treasury has sanctioned individuals from the Tri-Border Area (TBA) in South America for trafficking in counterfeit U.S. currency. Among other extensive fundraising activities in Africa, especially West Africa, Hizballah has been involved in the blood diamond trade since the 1980s. Prior to 9/11, Hizballah introduced al-Qa'eda to the blood diamond (sometimes called the ‘conflict diamond') business so that it could move its assets out of banking channels sure to be investigated after the attacks. In addition to currency counterfeiting, Hizballah also traffics in other counterfeit products, including pharmaceuticals. In a 2010 case, Lebanese police uncovered an Iranian/Hizballah operation that manufactured tons of fake "Captagon," a drug used to treat Attention Deficit Hyperactivity Disorder (ADHD). The counterfeit tablets were distributed worldwide, generating hundreds of millions of dollars in illicit profits for Hizballah. Hizballah established itself in South America's TBA soon after its establishment in the early 1980s. The TBA refers to the place where the borders of Argentina, Brazil, and Paraguay come together. Riding the vector of Lebanese Shi'ite emigrants fleeing a vicious civil war, Hizballah successfully set up operations that are estimated by various sources to bring in $10 to $20 million annually. Although the TBA was known as a lawless area long before Hizballah's arrival, the lack of effective law enforcement there made it an ideal location for Hizballah to take advantage of a criminal environment. It saw the area as a location where it could engage, relatively unchallenged, in recruitment and terror operations, planning and training even while fundraising through arms and drug trafficking, counterfeiting, document forgery, and music and software piracy. In fact both the 1992 and 1994 suicide bombing attacks in Buenos Aires were organized by Hizballah (working in collaboration with the Iranian Embassy in Buenos Aires) out of the TBA. In 2002, U.S. federal officials dismantled a Hizballah cigarette smuggling ring headquartered in Charlotte, North Carolina. Known as "Operation Smokescreen," the cell had been taking advantage of differences in cigarette taxes from state to state and raking in some $8 million in profits over the 4-year span that the scam had been in operation. Hizballah operatives associated with the operation had also supplied currency, financial services, false documentation, communications equipment, and explosives in support of the smuggling ring. Mohamad Youssef Hammoud, the ringleader of the group, and other cell members had entered New York City initially on forged visas provided to them in Venezuela. The Drug Enforcement Agency (DEA) investigated a December 2011 car smuggling operation based in Florida that involved some 70 used car dealerships across the U.S. that channeled profits to Hizballah. Cars bought in the U.S. were shipped to West Africa and other destinations. The transactions were facilitated through the Lebanese Canadian Bank (LCB), the Prime Bank of Gambia, and other subsidiaries, and ultimately transferred more than $480 million to Hizballah. As Matthew Levitt notes in his 2013 book, Hezbollah: The Global Footprint of Lebanon's Party of God, the operation highlighted the global reach of Hizballah's criminal operations. As noted above, narcotrafficking has moved into the top spot as a source of funding for Hizballah. Although Hizballah got its start smuggling hashish, heroin, and opium through traditional Lebanese clan smuggling channels out of the Beka'a Valley, it eventually leveraged those routes and criminal connections for terror operations. In the Western Hemisphere, Hizballah's drug running operations expanded throughout South America from that first foothold in the TBA. A leading Lebanese Shi'ite cleric, the Ayatollah Mohammad Hussein Abdullah Ali Fadlallah (sometimes called Hizballah's ‘spiritual leader') issued a convenient fatwa to permit Hizballah's drug dealing, which otherwise would have been considered "impure." Because the narcotics were intended "for Satan-America and the Jews," the theological justification went, "[i]f we cannot kill them with guns, we will kill them with drugs." Hizballah's narcotics operations in the Western Hemisphere involve the trafficking primarily of Colombian cocaine, which is moved north through Central America, via Mexican drug cartels to consumers in the U.S. and Canada, and also eastward through Venezuela, across the Atlantic Ocean, overland through West and North Africa, and eventually to target markets in Europe. Along the way, Hizballah collaborates with drug cartels, gangs, nation states, and other terrorist organizations like Colombia's FARC (Fuerzas Armadas Revolucionarias de Colombia) and al-Qa'eda in the Islamic Maghreb (AQIM). Money-laundering the massive amounts of cash generated by narcotrafficking and other criminal activities presents Hizballah with a challenge that is both financial and physical. The group uses both legal and illegal methods to move its dirty money, much of which is sent back to Lebanon. The rest is used to fund local operations. Couriers, friends, and family members are enlisted to carry cash either concealed on their persons or inside luggage. The advantages of a relationship with a nation state sponsor like Iran include regular (illicit) use of the diplomatic pouch system to transport bulk cash as well as other items. The Hawala system, in which money can be transferred across borders or across the world without actual physical transport, relies on personal relationships to avoid the possible scrutiny of customs officials. Legal money transfer systems such as Western Union are also used. Introducing ill-gotten cash profits into the legal banking system must clear regulatory hurdles, but is another way that Hizballah launders money. The use of the Lebanese-Canadian Bank in Hizballah's Florida-based car smuggling operation, described above, offers a good example of how this is done. As Iran and Hizballah well know, modern day terrorism costs money-lots of money. Even the few examples presented here of Hizballah fundraising activities, both legal and illegal, provide an idea of the massive amounts of profits raked in. The cycle of terror is completed as Hizballah turns those profits to the arming, outfitting, and training of its cadres. Although exact numbers are hard to come by, Hizballah fields thousands of fighters, including several thousand sent to prop up the Ba'athist regime of Syrian President Bashar al-Assad. In addition to their fanatical devotion to Shi'ite Islam and their Iranian sponsors, Hizballah operatives are superbly trained commandos who often boast advanced degrees and university educations. Hizballah's missile arsenal, much of it provided by Iran in the years following the 2006 war with Israel, includes upwards of 80,000 rockets and missiles, many with the range and accuracy to strike anywhere in Israel. Among these are the Fajr-3, Fajr-5 surface-to-surface models, a variety of surface-to-air missiles, and an updated version of the Fateh-110 missile with the range to reach Tel Aviv and even beyond with high accuracy. Southern Lebanon is studded with hundreds of Hizballah military facilities and missile launch sites, including many built into civilian homes located in scores of villages near Lebanon's southern border with Israel. Hizballah has constructed many of its weapons storage and other military installations in underground bunkers. Among other coveted-and expensive-dual-use, military, and other hi-tech gear that Hizballah has sought to acquire (for instance, with the proceeds of the North Carolina cigarette smuggling operation) are: night vision goggles and scopes, surveying equipment, Global Positioning Systems, metal detection equipment, video equipment, aircraft analysis & design software, military compasses, binoculars, naval equipment, ultrasonic dog repellers, laser range finders, digital cameras, zoom lenses, computer equipment (laptops, high-speed modems, processors, joysticks, plotters, scanners, and printers), stun guns, handheld radios and receivers, cellular telephones, nitrogen cutters, mining, and drilling and blasting equipment. Finally, it should be noted that Hizballah has developed an Unmanned Aerial Vehicle (UAV) capability with Iranian assistance. The group assembles the Iranian-designed Ababil ("Swallow") UAV and reportedly has launched at least five UAVs of this and other types towards Israel since 2004. Each has been intercepted and destroyed by the Israeli Air Force and none has been armed, although concern exists that Hizballah could configure a UAV to carry an explosive or even a biological warfare agent payload. Although there is little information available about Hizballah's chemical or biological weapons (CBW) capabilities, if any, the group's close relationship with Iran and Syria, both of which have advanced, sophisticated CBW programs, makes it likely that they have transferred at least some of that technological know-how, if not actual materials, to Hizballah. Hizballah's significant capabilities, its close and continuing relationship with Iran, a shared ideological commitment to the Shi'ite belief in the 12th Imam and the Jewish genocide that supposedly will bring on the End Times, and its deep involvement in criminal activities across the globe, are enough to make them a priority subject of national security concern. Add to that the extensive presence that Hizballah has established in the Western Hemisphere and the reality of its expanding collaboration with Mexican drug cartels that operate, not just along the U.S. southern border, but across it and into the majority of U.S. metropolitan areas, and that concern for national security can only deepen. There were no known operational cells of either al-Qa'ida or Hizballah in the hemisphere. Further, despite decades of evidence about the Hizballah presence in the Tri-Border Area (TBA), the same report refers to it as a criminal problem, rather than a terror issue. Most serious observers, in the media as well as the analytical, counterterrorism, and Local Law Enforcement (LLE) communities, know that this is inaccurate. Rather, as noted above, Hizballah's presence, narcotrafficking, and terrorist activities are all enabled by the expanding presence of Iran in the Hemisphere. Iran's own presence, in particular in South America, expanded significantly in the years after 2005, when Mahmud Ahmadinejad became president of Iran. As Alberto Nisman, the Argentinean prosecutor, explained in his May 2013 indictment, the numerous new diplomatic facilities and Islamic Centers that Iran opened across the region provided the cover slots Iran needed to accommodate IRGC/Qods Force and MOIS operatives in countries that include Brazil, Chile, Colombia, Guyana, Paraguay, Surinam, Trinidad and Tobago, and Uruguay. According to Nisman, Iran seeks to infiltrate South American countries "by building local clandestine intelligence stations...to sponsor, foster and execute terrorist attacks, within the principles to export the Islamic revolution." Bilateral agreements between Iran and various Latin American countries provide Iranians with troubling access to citizenship, travel documents, and visas. For example, in 2008, Dominica signed an agreement with Iran that allowed Iranians to obtain second citizenship and the Dominican passport to go with it. It is worth noting that Dominica is a member of the British Commonwealth. St. Kitts and Nevis also sell passports to Iran, while in St. Lucia, St. Vincent and the Grenadines, passport and document control is reportedly so loose that practically anyone can change identity there at will. The relationship that Ahmadinejad forged with Venezuela's president Hugo Chavez over the eight years from 2005 to 2013 was perhaps the closest of all, and included the signing of hundreds of bilateral accords and the establishment of dozens of wholly owned Iranian firms in Venezuela, plus many more joint venture companies. Financial institutions in particular were used to help Iran evade the restrictions imposed by international sanctions over its nuclear weapons program, generate cash, and conduct money laundering. Margarita Island, in the Caribbean off Venezuela's northern coast, has become a key hub of Hizballah operations and its primary banking and finance center in the Western Hemisphere. Hizballah maintains businesses, safe houses, and training camps there. In February 2013, Mohammed Razza Hidari, Iran's former ambassador to Venezuela, told El Universal, a Venezuelan daily, that Hizballah recruits train locally in Venezuela before being sent to Iran for more advanced military, political, and religious training before returning to Latin America to begin their missions. Closer to home, Hizballah conducts a wide array of criminal activities in Mexico where its growing nexus with Mexican drug cartels provides entrée directly into the U.S. Ambassador Roger Noriega, a former U.S. envoy to the Organization of American States (OAS) and an Undersecretary of State for the Western Hemisphere, testifies regularly before Congress to warn about Hizballah's expanding encroachment into the U.S. In March 2013, he testified before the House of Representatives Committee on Foreign Affairs' Subcommittee on Terrorism, Non-Proliferation, and Trade to sound the alarm on "Hezbollah's Strategic Shift: A Global Terrorist Threat." Noriega told them that Hizballah is no lone wolf but operates at the behest of Iran for the purpose of targeting the U.S. because of their shared hostility to this country. He discussed how Hizballah engages in smuggling, money laundering, training and fund-raising as part of doing business with the Mexican drug cartels. It is not simply as another "modus operandi of powerful international drug syndicates that can be tackled by law enforcement," but rather as the by-product of a "conscious strategy by Iran to wage asymmetrical warfare against the U.S." Unfortunately, as evidenced by the State Department's 2012 Country Report on Terrorism as well as the scarce attention paid in the mainstream media, whether print or broadcast, both have tended to minimize this threat. At a time when the southern border of the U.S. with Mexico, especially in places along the Arizona and Texas borders, has become a virtual war zone, according to sheriffs and ranchers living there, Hizballah and other Islamic terrorist organizations are taking full advantage of that deteriorating security situation. The composition of the flow of illegal border crossers has changed in recent years, according to accounts given this author, who visited the border in September 2013. That flow increasingly is made up of either militarized columns of drug mules, (complete with armed escorts toting AK-47s and scouts with sniper rifles and hi-tech commo gear guarding the high ground on both sides of the border along their routes), or dedicated cartel operations to bring ‘special interest aliens' (be they al-Qa'eda, al-Shabaab, or Hizballah) across the border and into the U.S. A July 22, 2010 report from the Government Accountability Office (GAO) disclosed that "some Mexican drug trafficking organizations specialize in smuggling special-interest aliens into the United States." "Special interest aliens" are defined as those from places that pose a terrorist threat to the U.S. Ranchers tell of finding abandoned prayer rugs and Qur'ans on their land, while the special night vision cameras they set up catch images of border crossers who drop to the ground, facing towards the east, to pray just as the sun is coming up. According to frustrated sheriffs along the border, like Arizona Pima County Sheriff Paul Babeau and then-Cochise County Sheriff Larry Dever who appeared on FOX News in 2011, Customs and Border Patrol (CPB) officers are deeply frustrated by explicit orders not to find illegal border crossers even when they know there are thousands of them crossing by the week. According to Dever, CPB in Arizona is under orders from the Department of Homeland Security (DHS) in Washington, D.C. to "keep apprehension numbers down..." This author was told the same thing in September 2013, when the "turn south" policy was explained: CPB officers wielding flashlights and sticks advance in a line across the desert at night when they know there will be hundreds of illegal border crossers in a particular area, and literally beat the bushes to drive the illegals back towards and across the Mexican border. This accomplishes nothing of a serious nature, but helps to keep those apprehension numbers down. DHS representatives naturally deny any such thing is occurring. And aside from local Arizona papers and a few conservative outlets, there is little attention paid to America's increasingly porous and increasingly dangerous southern border. The desperation there is real and it is growing. The current six-month deal with Iran is all about the future development and uses of Iran's nuclear program. In the meantime, Hizballah is still generally viewed as an Iranian backed militia situated in Lebanon, operating as a surrogate fighting force against Israel and on behalf of the Syrian regime. But in fact it has grown into an international threat of enormous proportions that must be confronted regardless of the outcome of the current negotiations with Iran.